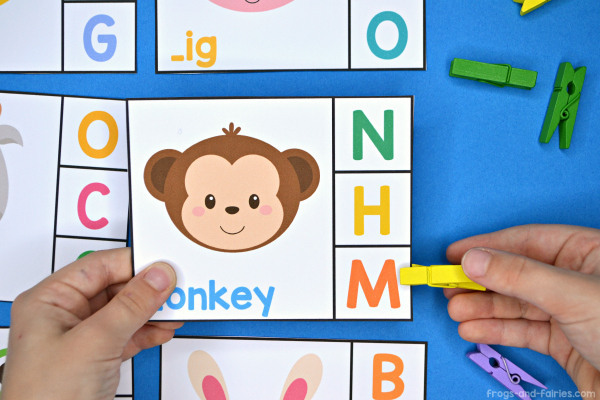 Looking for an activity to help your little learners master beginning sounds? 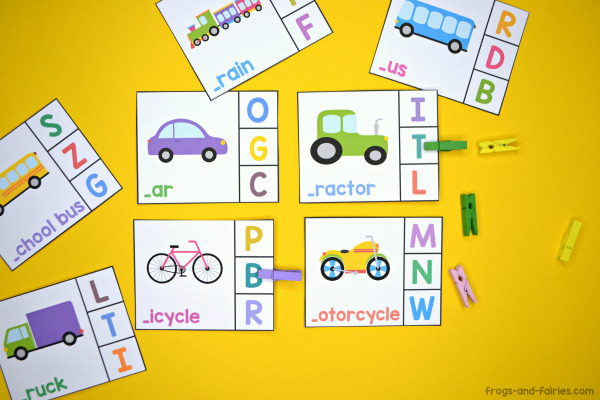 These playful Beginning Sounds Clip Cards with cute pictures of animals, smiley fruits and veggies and transportation vehicles are a fun way to practice! Early pre-reading skills are very important to build a strong foundation for learning how to read. 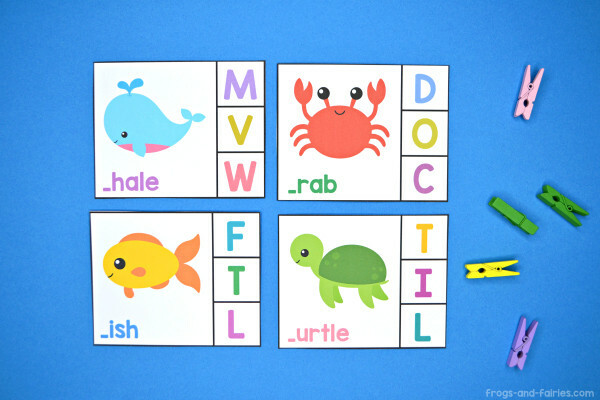 These clip cards will help kids practice beginning sounds and strengthen their fine motor skill as well! Each clip card has a picture on it that begins with one letter of the alphabet. There are 3 letter choices to choose from. Your kids will try to figure out the beginning sound for each picture and clip the correct letter on the right side of the card. 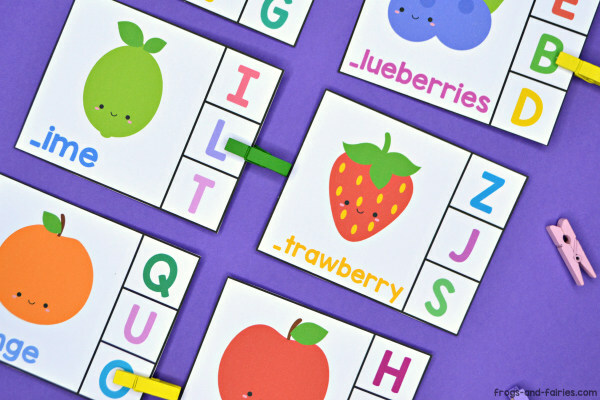 This low prep activity consists of 4 different themes and includes 72 clip cards with cute & colorful pictures! Included themes: transportation, fruits, vegetables and animals! 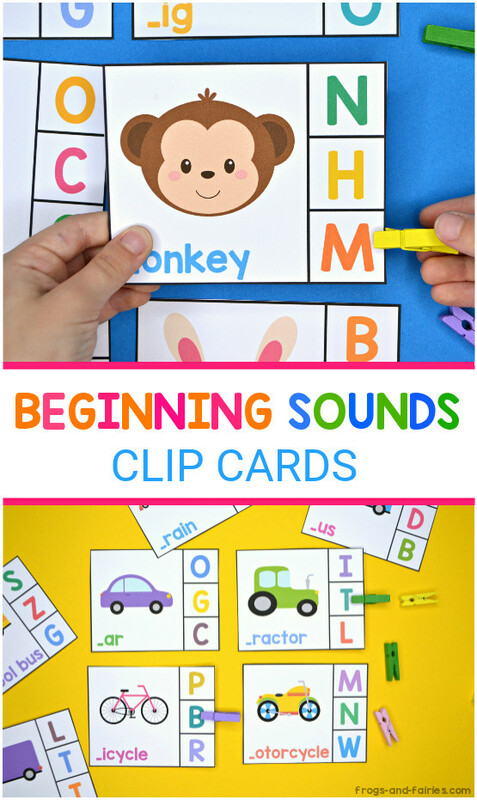 To purchase these Beginning Sounds Clip Cards, click HERE. Your kids can then flip them over to make sure they answered correctly. This PDF printable set includes 18 pages of 72 clip cards. TO PREP: Print out the cards. Print on cardstock for more durability. Cut out the cards. You can laminate them for even more durability. TO PLAY: Each clip cards includes 3 number choices to choose from. Your little learners need to recognize the beginning sound of each picture and place a clothespin or another object on the correct answer for each card. Looking for more activities with beginning sounds? Then also check out our Sheep Beginning Sounds Match and Hot Air Balloons & Animals Beginning Sounds Match!